Subjects, styles, advertising, other relevant information: Michael Rouse records that Arthur Holdgate ran a pharmacy and post office in Cottenham. He produced a series of local real photograph postcards, the one illustrated in Rouse's book is labeled on the lower LH in neat hand written caps "C20 Post Office Cottenham". It is not known at this stage who was Holdgate's photographer. Arthur trained as a chemist at Newmarket in the 1870s. 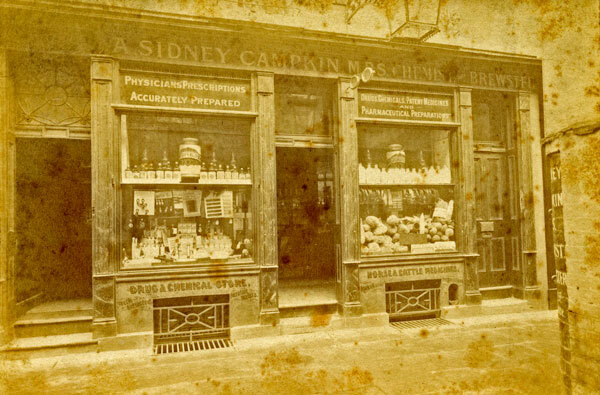 From 1881-1911 he was a pharmacist in the High Street at Cottenham. He lived on the premises with wife Ada (b:1860 at Kimbolton). In 1911 they lived with their two sons Arthur Stanley (b: 1882 Cottenham) and William Gordon (b:1885 Cottenham). Subjects, styles, advertising, other relevant information: Alfred was the son of a miller. In 1881 he was employed as a gardener in Somersham. In the 1901 census Alfred was living in West End Somersham with his wife Annie Maria (b:1869 Royston) and their three children, all born in Somersham: Elsie May (b:1893) Cecily Eva (b:1895) and Ella Marion (b:1897). Alfred was a photographer working on his own account from home. 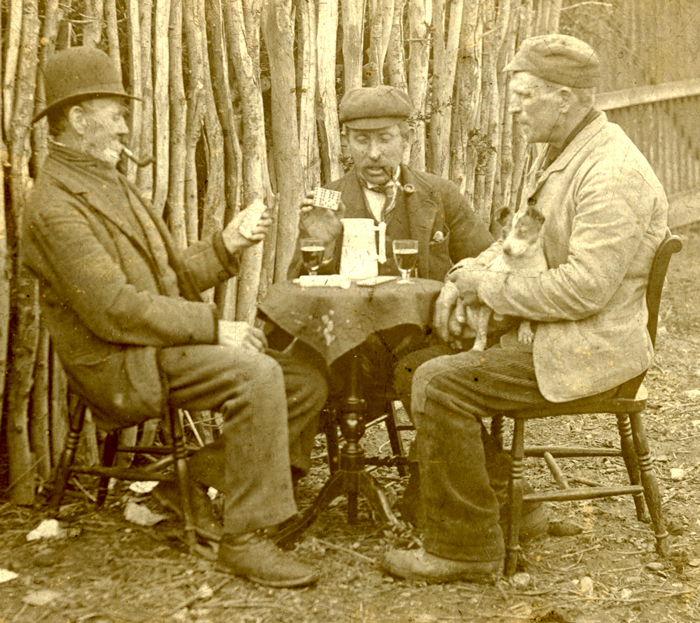 The same situation applied in 1911 when the family was living in the High Street at Somersham. Business could not have been that prosperous for Alfred as his wife was employed as a "charwoman" and two of his daughters as "day girl domestics". References: Cambridge Yellow Pages 1990, 1995, 1997, 1998. Cambridge Evening News 20 June 1987. Working Dates: c.1980 – still in business in 2016. The Cambridge Evening News, 30 July 1999, reported that there was an exhibition of prints on hand made paper by Cambridgeshire photographer Andrew Houston at The Old Fire Engine House, Ely. Subjects, styles, advertising, other relevant information: There is a single directory entry for Mary Howard in 1912. The only Mary Howard in Chatteris in the 1911 Census return was Mary Amelia Parker Howard b:1856 Manchester, the wife of a shopkeeper John Thomas Howard (b:1854 Boston Lincs). No occupation is shown for Mary. In the 1901 census the couple were in March Cambs, again no occupation shown for Mary. In 1891 the couple were in Ramsey and Mary's occupation was shown as a "grocer's assistant". Subjects, styles, advertising, other relevant information: Thomas Howell's parents lived at Warmington, near Oundle. Thomas trained as a chemist and an opthalmologist and for a while operated a mobile service as a travelling optician visiting local villages in the Oundle area. He came to Cambridge and by 1939 was living with his wife Rose Isobel, Nee Burdis, at 69 Windsor Road, Cambridge. Thomas was interested in photography; taking photographs and developing and printing. He set up a darkroom upstairs at No 69, at a time when film and chemicals were difficult to obtain. 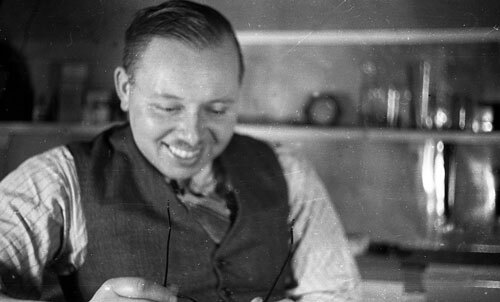 By around 1944 to 1948 Thomas operated part time as a professional photographer. 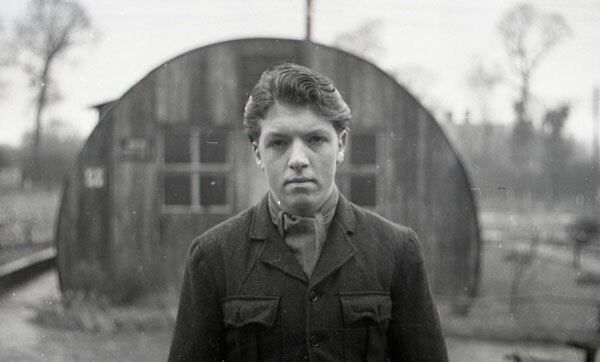 He undertook commercial photography for local estate agents Carter Jonas, photographing interiors and exteriors of large houses, but his speciality, when shortages made photography difficult, seemed to be snapshots of families and children taken in their back gardens, to be sent to their loved ones, including those who were incarcerated in POW camps overseas. He marketed his services via the Cambridge YMCA. 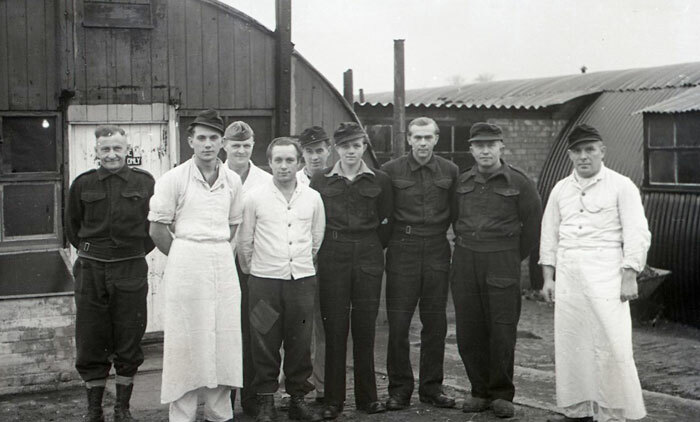 Thomas also took photographs of prisoners of war and staff at British POW camps in the UK at Royston and Trumpington. 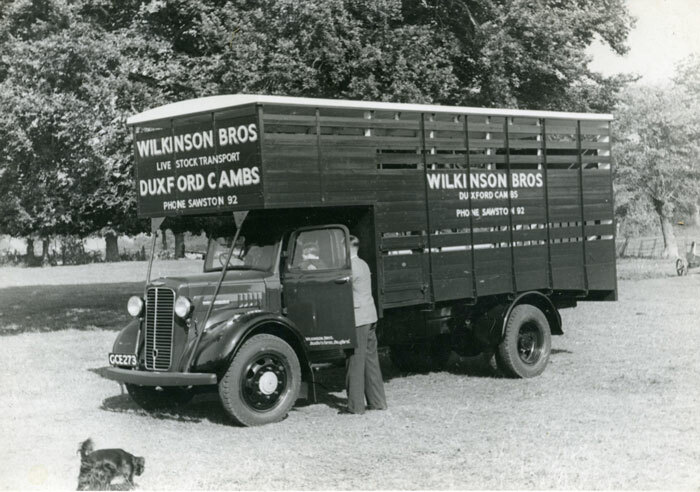 By the mid 1940s Thomas had joined the Cambridge firm of A Sidney Campkin and Sons, then run by Francis Sidney Campkin, who was also becoming increasingly interested in photography. 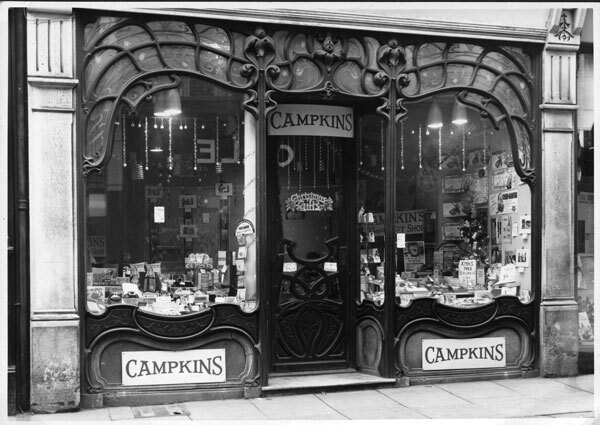 Campkins had their shop at No 11 Rose Crescent Cambridge, and had a pedigree back to 1800 when the firm was started by an Apothecary called William Brewster. 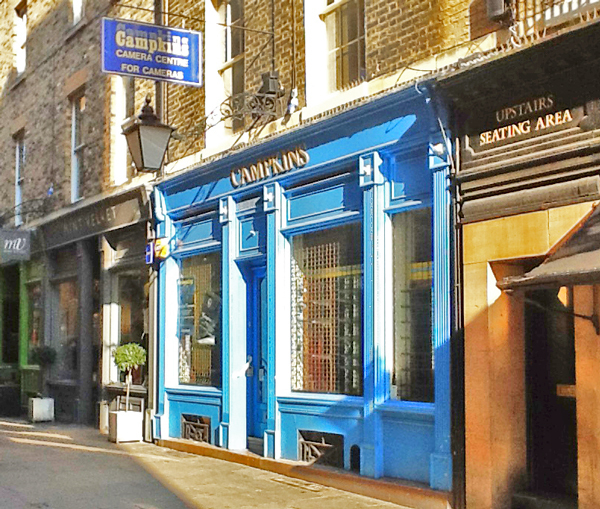 Between 1944 and 1945 the firm changed focus from "chemists and opticians" to "chemists, opticians and photographic dealers" and by 1946 Thomas was the partner of Francis Sidney Campkin, who continued to be associated with the firm until his death in 1955. Thomas moved his darkroom to 11 Rose Crescent and A Sidney Campkin and Son, in their 1945 "Cambridge Almanac" (a free annual publication produced by the firm from 1875 to 1948 to advertise their Cambridge remedies and other services) stated that they were undertaking "Developing and printing from spools and superb enlarging from your best negatives. Bring all photographic work and enquiries to us". By 1946 they were offering "expert photographic advice" and promised that "full stocks of bromide and gaslight papers would soon be available as soon as "present quota restrictions permit". 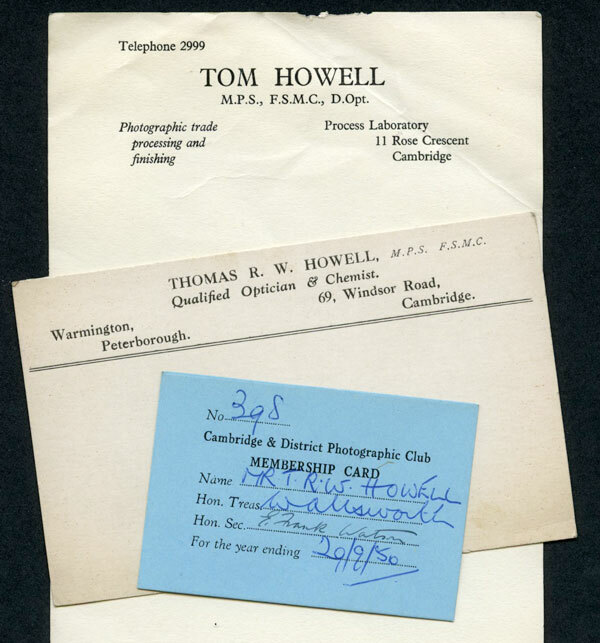 They urged those interested in photography to join the Cambridge Photographic Club, of which Thomas Howell was a member. By 1947 they stated "our own developing and printing service carried on at 11 Rose Crescent, is the quickest quality service obtainable in Cambridge". 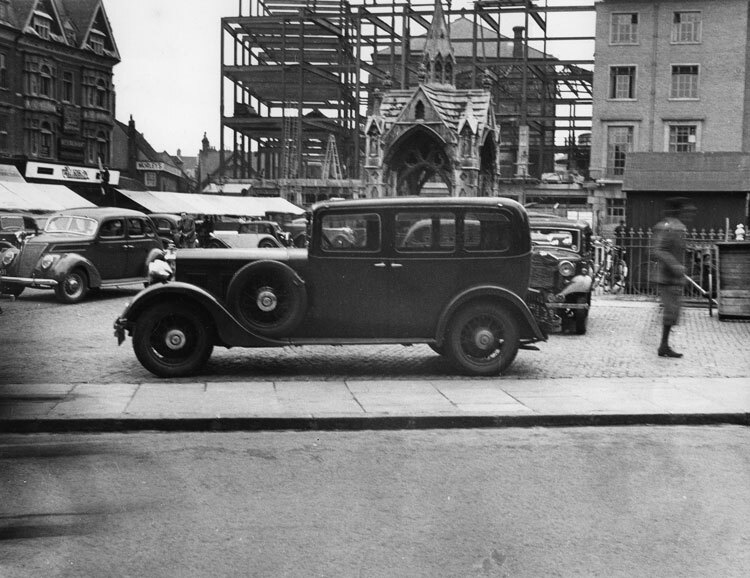 In Campkins 1948 Cambridge Almanac Thomas had written an article "Introducing photography" and two of his photographs (depicting Kings College and the Round Church) made up the publication's centre spread. Thomas Howell was a very effective entrepreneur and grew his business from a single chemist's and optician's shop to a modern technical firm employing around 100 staff with shops and studios in Cambridge, Peterborough, Lincoln, London and Dublin. As the Campkin photographic business grew so Thomas became more involved in the management of the business and less in his own commercial photography activities. But he was certainly taking some photographs in the 1990s and a photograph he took of Concorde at the Farnborough Air Display he made into a postcard commemorating the aircraft going out of service (the postcard sold well). 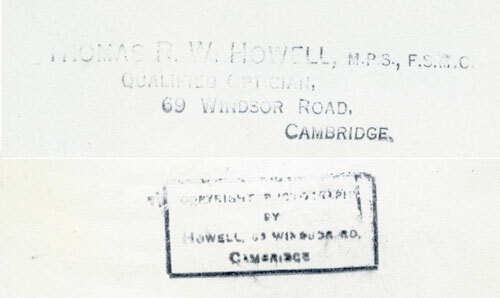 Thomas Howell's companies included British Trade Equipment Ltd, Campkin's Opthalmic Opticians Ltd, Campkin's Camera Centre Ltd, KP Professional Sales Ltd, and Anglia Photoworks Ltd. . 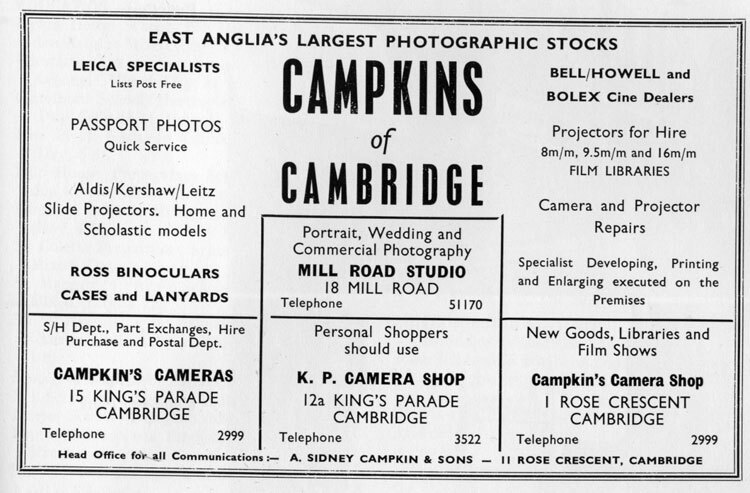 Some of Campkin's enterprises which were individually listed as photographers in local trade directories are listed elsewhere on this site. 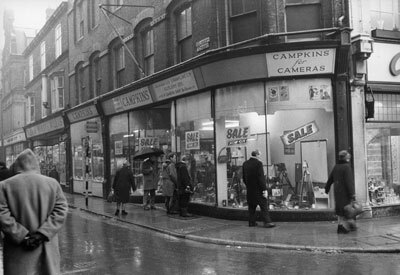 Other Cambridge shops were at 1 and 11 Rose Crescent, Kings Parade and Market Street (Premises formerly occupied by photographer Ralph Lord). 11 Rose Crescent, closed in 2015. Name: HOWELL, Thomas Richard b: 1844 Hampstead d: 1918 Yarmouth. 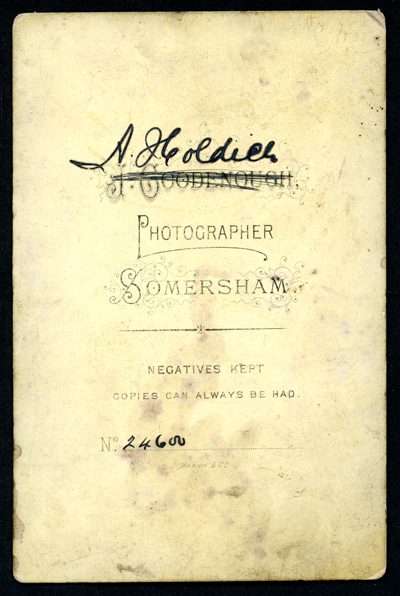 Subjects, styles, advertising, other relevant information: In 1881 Thomas was a photographer living as a boarder at a public house in High Street Newnham Gloucestershire. He was shown as married, but his wife was not at the same address. In 1889 an advertisement appeared in the Cambridge Daily News on 6th August "T.Howell, portrait, landscape and architectural photographer 26 Lisburn Road Newmarket, under the distinguished patronage of HRH The Prince of Wales; HRH The Duchess of Teck; The Marquis of Lansdowne; Sir John Kennaway; The Rev John Lamport; Newport, Essex; and the London Artists Rifle Volunteers" In 1891 Thomas was shown in the census as a photographer living at 26 Lisburn Road Newmarket, with his wife Amelia (b:1853 Islington). They had a 25 year old racing groom as a lodger. In 1899 Richard Buck, a tailor of Newmarket, was charged in the local Magistrates Court with using threats towards Thomas Howell, photographer at Newmarket on March 15th. Buck was discharged when Thomas stated that he was no longer in fear of the defendant. In 1901 Thomas was at the same address, still working as a photographer, from home on his own account. By 1911 Thomas and Amelia had moved to 7th Row 63½ Great Yarmouth, Norfolk, and he was still working from home as a photographer on his own account. 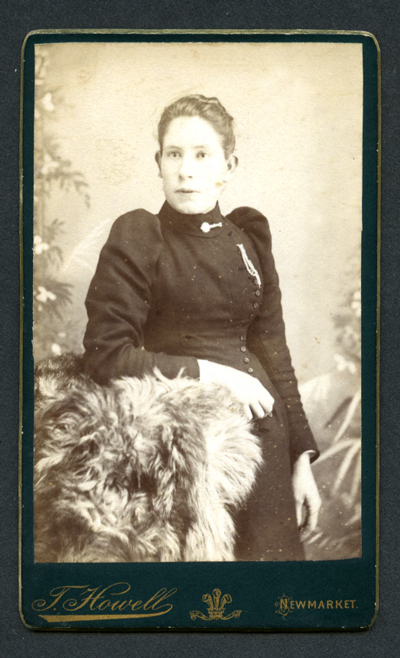 See below a carte de visite of an unknown woman with fur, mounted on black mount with bevelled gilt edges and plain reverse, 1890s, author's collection. On the face is written "T Howell Newmarket", with the Prince of Wales feathers. Subjects, styles, advertising, other relevant information: retirement parties and business functions, groups, on location, family, sporting etc, wedding and christening photography, formal and child portraits, school events and playgroup. Daytime and evening bookings taken. Commercial and advertising, brochures and travel. Subjects, styles, advertising, other relevant information: The 1939 Register shows Arthur as an apprentice photographer. At the same address were: William A Howes b:1889 weighing machine maker and Kate Squires b:1895, house keeper. 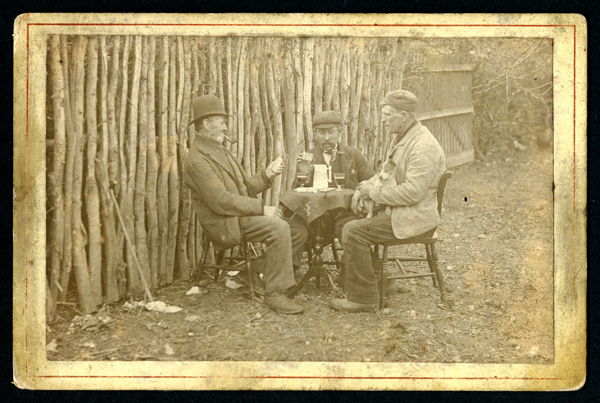 Subjects, styles, advertising, other relevant information: In 1881 Herbert was shown as a photographer living with his father and sister at Carter Street, Fordham. His father William Howlett b: 1821 Newmarket was a tailor and his sister Laura Anna Howlett b: 1862 Fordham. By 1891 Herbert, still resident at Fordham, had become a rural postman. Subjects, styles, advertising, other relevant information: Edith was the daughter of Thomas Hunnybun b: 1860 Cambridge, coach and harness maker, and Emma Louise Hunnybun b: 1862 Cambridge. In the 1911 census Edith was living at the above address with her parents and two older sisters and a younger brother. Edith was employed as a photographer's re-toucher: it is not known at this stage who employed her. In 1920 at Hendon, Edith married schoolteacher William Thomas Guy b:1891. In 1939 the couple were living at 4 Parkfield Ave, Harrow Middlesex. William was a school teacher and Edith's work was shown as unpaid domestic duties. References: 1911 census, 1939 Register. Address: 95 Fitzroy Street and 8 St Edwards Passage Cambridge, in 1895 and at 130 Fitzroy Street 1899/1913, at 13 Fitzroy Street Cambridge in 1916, at 90 Fitzroy Street 1922 and at 9 Fitzroy St 1922/5. Subjects, styles, advertising, other relevant information: Thomas Bidwell Hunt was the son of Reuben Hunt, a millwright. He was born in Ely and trained initially as a gilder and in 1871 was living with his family at 24 Fitzroy Street Cambridge working as a gilder's assistant. In the census return in 1881 Thomas was living at 5 Portland Place Cambridge with his wife Alice (b:1857 Cambridge) and children: Alice Maud Mary (b:1875 Cambridge), Emily Johannah (b:1876 Cambridge) and Thomas Reuben (b:1878 Cambridge). Thomas was described as a "carver and guilder". In 1891 Thomas and family were living at 95 Fitzroy Street. Thomas was described as a "photographer". Additional children were John H. (b:1882 Cambridge) and William J. 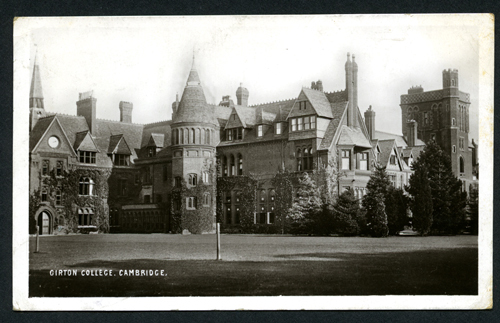 (b:1886 Cambridge). In an advertisement (reproduced below) in the Cambridge Daily News on 9 Sept 1899 P1 Thomas announced the opening of first class studio at 130 Fitzroy Street, Cambridge. In 1901 the family was living at 95 Fitzroy Street Cambridge. Thomas was again described as a "photographer, carver and gilder", working on his own account from home. In addition to Thomas and Alice, the family comprised Alice Maud Mary (described as a photographic printer), Emily Johannah (shop assistant), Thomas Reuben, (described as "photographer") William J.E. (office boy) and Frank, b:1888. 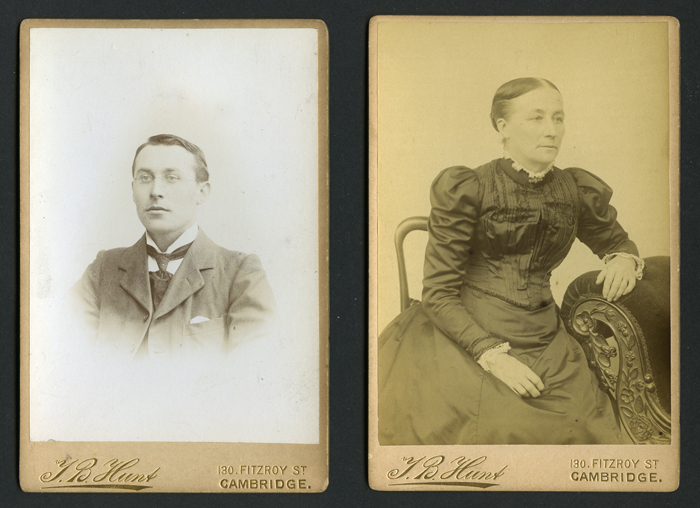 It appears that Thomas ran a family photographic business .In 1911 the family, consisting then of Thomas, wife Alice and daughter Emily Johannah were living at 5 Clarendon Street Cambridge. Thomas was again described as "photographer carver and gilder". Thomas was described in directory entries as "Photographer and picture frame maker" in 1896 and 1904. Some 500 or so of his negatives have survived in the Cambridgeshire Collection from which we can see that Thomas was a portrait, landscape and architectural photographer. 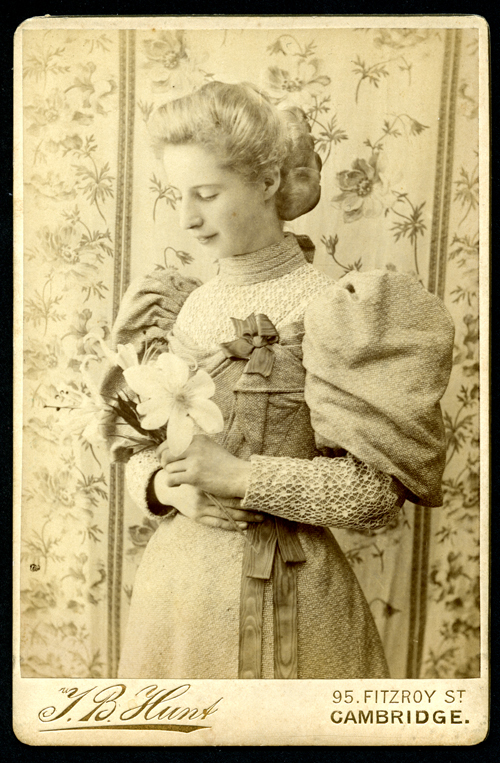 See below a cabinet photograph from the 1890s of a delightful looking lady with leg of mutton sleeves and holding lilies, photographically rather spoiled by the very detailed floral background. This shows the 95 Fitzroy Street address - the mount has gilt edges and writing; the reverse of the mount is blank. Next are two other cabinet portraits cream mounts with gilt edges, reverse blank and the name TB Hunt and address 130 Fitzroy Street Cambridge in gilt lettering on the bottom of the face of the mount. In September 1923 Thomas's business suffered a setback when there was a fire at T.B. Hunt's photographer’s shop Fitzroy Street; confined to an outhouse which he used as a developing room; destroying cameras plates and a developing set. Subjects, styles, advertising, other relevant information: The son of Thomas Bidwell Hunt above. In 1901 he was living with his parents at 95 Fitzroy Street Cambridge and was described in the census as a photographer. In 1911 Thomas Reuben was married to Catherine Frances (b:1881 Cambridge) living at 65 Humberstone Road Cambridge with a daughter Catherine Alice Hunt (b:1910 Cambridge). In the 1912 Kelly's Directory of Cambridgeshire he was described as “Late of Hills and Saunders”, so he either trained at their Cambridge Studio as a very young man prior to their bankruptcy in 1892 or for a while lived away from Cambridge and worked at one of their other studios. 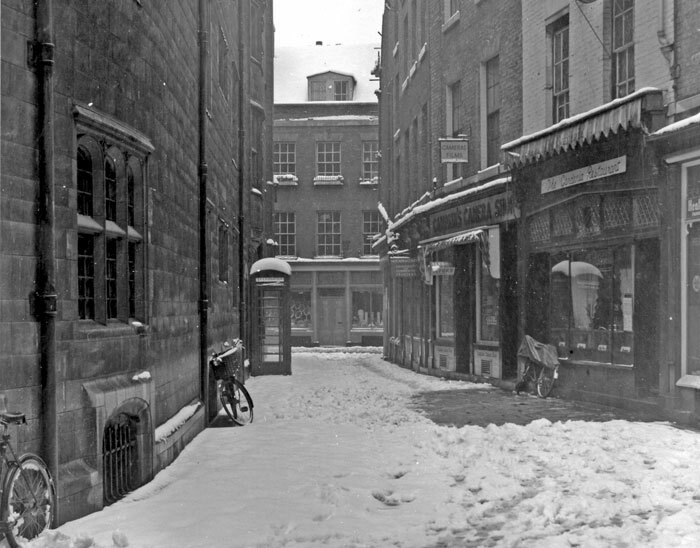 He later took over his father's business in St Edwards Passage, Cambridge. There is only one local trade directory for him - 1912, suggesting he ran the business in his own name for a short time. 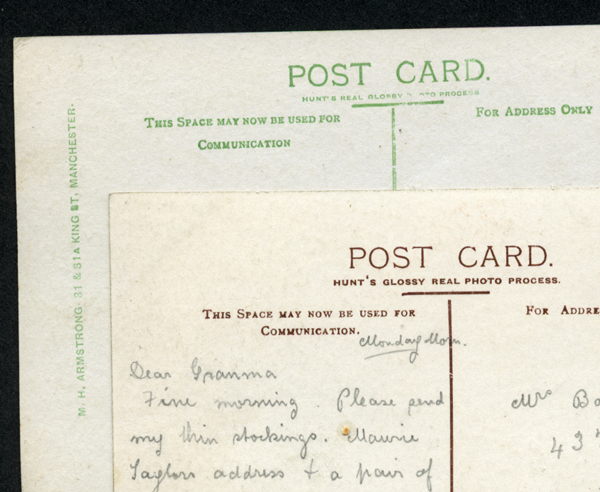 Subjects, styles, advertising, other relevant information: Below is a real photograph postcard with glossy finish and white border with "Hunt's Real Glossy Photo Process" printed beneath the heading "Post Card" on the reverse. 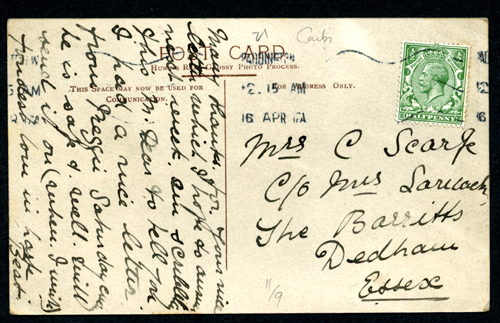 The subject of the post card is Girton College Cambridge, and the card has been postally used, bearing what appears to be a 1917 postmark. The local subject suggests a Cambridgeshire photographer (possibly one of the "Hunt"s listed above) but is more likely that this was a photographic process available to any photographer wishing to produce good quality glossy RP postcards from their images. Hunt could have been a photo processor somewhere who processed images for any photographer, producing from them quality glossy postcards. Alternatively Hunt could have supplied a "kit" of materials to enable photographers to print up their own images as quality postcards. Perhaps at some future date an advertisement will be found for Hunt's Real Glossy Photo Process to give a better idea of the origins of these cards. Below is a scan of the reverse of two other "Hunt's Real Glossy Photo Process" RPPCs from the author's collection. The top one is from a postcard depicting the Market, Great Yarmouth, Norfolk and has been postally used in 1908 - The wording is subtly different - "Hunt's Glossy Real Photo Process". Below that is the green printed reverse of another RPPC, not postally used, depicting The Choir at Manchester Cathedral. In this case there is also printed on the reverse the name of the photographer or publisher, M.H.Armstrong 81 and 81A King Street Manchester". The type faces on the images of the Cambridge and Great Yarmouth examples are similar, but that on the Manchester example is different. Subjects, styles, advertising, other relevant information: Listed in local directories 1847 and 1850 as a portrait painter - did he become involved in early photography? Subjects, styles, advertising, other relevant information:On census night 1891 Thomas Huskinson, a photographer's assistant, was lodging at 10 Park Cottages Newmarket, home of Jack Lepla printer compositor and his family. No other traces have yet been found of this photographer. References: Mike Petty, The Photographers, (a handlist of local photographers), Cambridge, Cambridgeshire Collection, 1992. Not yet identified from Census returns.